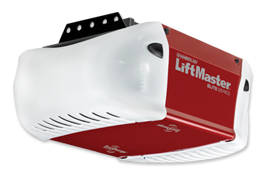 The LiftMaster garage door opener product line is manufactured by Chamberlain® and is their premium series of dealer installed garage door openers. The line is feature-rich with up-to-date technological advances such as MyQ™ technology and LiftMaster® Internet Gateway which allow you to operate your garage doors and home lighting from your smartphone or a computer, anywhere in the world! The product line includes garage door opener motors that are 1/3, 1/2 and 3/4 horsepower units, and features a nice selection of screw-drive, belt-drive and chain-drive models. The accessories that Chamberlain® offers for the LiftMaster line appear to be endless covering the complete spectrum of owner desired features not available on many branded lines offered today. 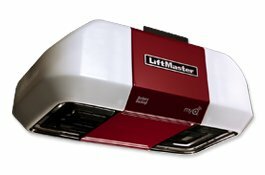 The LiftMaster garage door opener Model 8550 Belt Drive shown at the left takes safety and convenience to an entirely new level. The reliable, integrated battery backup system guarantees access in and out of your garage, even when the power is off. All safety and security features will continue to operate as well. The 8550 model is also equipped with the MyQ® technology allowing you to control your garage and home lighting from anywhere in the world with a smartphone or computer. The powerhead features soft-start and slow-stop to reduce noise when it operates - a big plus if you have living space near the garage. The LiftMaster garage door opener auto-force feature constantly monitors the garage door system and adjusts forces to temperature fluctuations, floor height variances, and door trackage movements. The Smart Garage Door Opener® lets you electronically program security codes from the Smart Control Panel® or the powerhead. The Model 8550 features an enclosed gear case that provides continuous lubrication of the screw-drive mechanism for the smoothest and quietest operation possible. The powerhead delivers 200 watts of light with an adjustable light time delay for your convenience, and the powerhead meets UL235 requirements. The Protector System® sensors project an invisible light beam across the plane of the garage door opening and automatically reverses the door if anything interrupts the beam while the garage door is traveling downward. The sensing technology will stop the door from closing if contact is made with a person or object and the opener lights automatically activate when the infrared beam is broken. Security+® rolling code technology assures a new code is sent every time the remote control is used. PosiLock® theft protection assures that once the door is closed, it stays locked unless you send a new valid remote signal or use the manual release handle. The Model 8550 is HomeLink® compatible with QuickTrain® technology. The Elite Series™ Model 3840 Screw Drive shown at the left features a *3/4 HPS® DC motor with fully integrated battery backup for when the power fails. It can power your garage door for up to 40 cycles within a 24 hour period and recharges automatically when the power comes back on. All safety and security features operate from the battery backup as well - ensuring your family is protected at all times. The unit runs smoothly and quietly in all temperatures and features a self-lubricated maintenance-free rail system. The Model 3840 features an enclosed gear case that provides continuous lubrication of the screw-drive mechanism for the smoothest and quietest operation possible. The powerhead delivers 200 watts of light with an adjustable light time delay for your convenience, and the powerhead meets UL235 requirements. The Protector System® sensors project an invisible light beam across the plane of the garage door opening and automatically reverses the door if anything interrupts the beam while the door is traveling downward. The sensing technology will stop the door from closing if contact is made with a person or object and the opener lights automatically activate when the infrared beam is broken. The Model 3840 has attained the Good Housekeeping seal for garage door openers. This model has a full line of accessories available. Contact your nearest LiftMaster dealer for more detailed information, and installed cost estimates. (*Horsepower strength with same lifting force specifications as 3/4 HP LiftMaster garage door openers).